I think I added to much lump in at the start, the temp kept going up on me and even with both top and bottom vents fully closed was getting to hot so I ended up using some tongs to get some of the lump out and then did the burp/open-close method to get the temps back down, didn't have to add any more lump in during the cook so this one gave me an idea of how much lump I will need in the future, I took about half out and it was fine I got it settled at about 275 and left well enough alone for the rest of the cook. I also need to get a wireless thermometer system, I was obsessive about going on checking on it every 15 mins, drove my wife crazy lol. I am new to kamado cooking as well but what I have learned from reading posts from the pros is that when you are doing low and slow, just light one or 2 places on your charcoal pile. I always put more charcoal in there that what I need but if you control the temps and your shutdown, you will have plenty left over. My big fear is running out of fuel and having to add so I am sure I am always overkill with the amount. I light a couple of places and bring the temp up very slowly. I experimented with mine before I ever started cooking to understand timing and how much to open/close my vents. When I know the coals are lit, I set the vents and get away from it for 20 mins or so and come back to see where it is at. If I stand there and watch it, I will have the urge to keep messing with it so for me, getting away from it is best. I don't have small children running around so I am comfortable leaving it. I have read that bring the temp down take a long time so I bring mine up very slowly. I figure I can always light more coals if I can't get the temp up or they go out. Does having a full tank of gas mean your car will go faster than you want? No! Well having a full firebox of lump doesn't mean that temps will get out of control. Temps in kamados are all about airflow. Period. What happened is you probably lit too much lump at the onset. Spend a weekend afternoon getting to know your kamado. Always begin every cook with a full firebox. Light a single spot in your lump pile. Hit 225. Let your kamado settle at 225 for 30 minutes. Then hit in succession 250, 275, 300, 325, 350, 375, 400, 425, 450, 475, and finally 500°F. At each temp let your kamado settle for 30 minutes. Make note of the vent settings at each temp. These vent setting will never change for your specific kamado. Within a given range, i.e. 200-300, you fine tune temps with the top vent. The bottom vent is used for gross adjustments. When you move from one range to another, i.e. from 200-300 to 300-400, you'll open the bottom vent and close down on the top vent when moving up. Remember, the top vent is used to fine tune temps within a certain range. Nothing will cure the problems you related but spending time getting to know your kamado. If you don't, you'll NE chasing temps forever. Don't worry, we've all been where you are right now. ^ fine advice by a seasoned pro! That's a common misconception when you start - that you have too much lump in the firebox. Ceramic Chef nailed it when he said it's all about air flow. The more air moving through the coals, the hotter your grill will be. Opening the dome every 15 minutes will also impact the air flow in your grill and cause temperatures to be all over the place. Tell your wife she was right! Don't worry - all of this is in the normal learning curve for a kamado. Do what CC suggested - get a cheap bag of lump and spend a day SLOWLY changing the settings and see what happens. You'll be much more comfortable on your next cook. You also learned the most valuable lesson... even when things don't go as planned, kamados still deliver some fine food! Keep it up, ask questions, post pictures and cook summaries - you'll be a pro in no time. Thanks everyone, thats good advice! I did only light two places in the lump, I used 2 KJ starter cubes, 1 in each location, I think what happened was after I let the coals light for bit and then started watching the temps, I got it to sit at first right at 250, then I had to open it up for longer than I wanted to get the deflector in, grate, drip pan, etc. and during that time I think too many coals got lit. 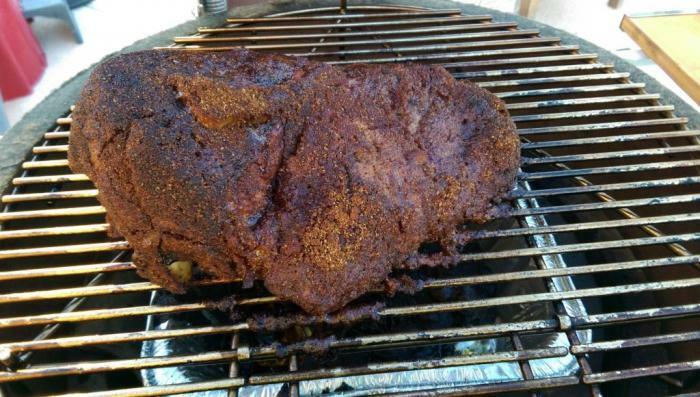 I let it sit for awhile to stabilize with those things in place and thats when it started climbing on me, I closed the vents down for awhile and had the thicker white smoke so didn't want to put the meat on with that white smoke and get a bitter taste. Once I took some of the lit pieces of lump out and let it restablize, I got it back under control. When I was constantly checking the temps, I didn't open it often, just checked the dome gauge to see where it was at. I am curious how far off my dome gauge is which is another reason I would like to get a probe type thermometer. Thanks for the encouragement everyone, we are going to try some pizza's this weekend. The pork sure turned out good in the end...we have eaten almost off of it already!!! For a low-n-slow on a cooker like your Safire, you only need to lite a single spot. Two is one too many. That's why your temps got away from you at the beginning. Secondly, you should already have everything already in your Safire. Get everything up to temp. It's called heat soaking and to my mind, it helps the cooking process. You'll notice few temperature transients. You'll do just fine with that Safire. A few cooks and an afternoon spent with your Safire and a cooler of cold beer and you're set! Ceramic Chef is spot on. Get to know your grill. Airflow is everything. For low and slow I use 1/2 a fire cube. Dang that would have been a good deal...shows as $69.99 now when I click that link. Thanks for the tips, will try just one spot next time with everything in the grill already and ready to go from the beginning.